Every cook needs a good dessert recipe that can be whipped up anywhere -- especially when you're away from your kitchen and its mixer and rolling pin and comforting gadgets. 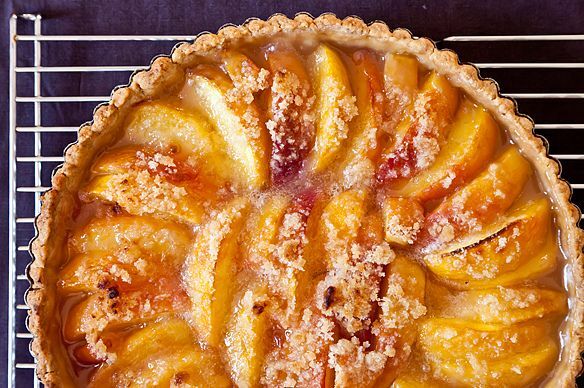 This peach tart is that recipe for me. To make it all you need is a knife, a bowl, and some kind of pan. A tart pan ideally, but I've even made it on a baking sheet with one side shored up with aluminum foil. And when I've been without a bowl, I've mixed the dough right in the pan. I got the original recipe from my mother, who uses all vegetable oil in the crust. I use half vegetable oil and half olive oil. She neatly peels her peaches. Lazy kin, I do not. Hers is probably better, but you are stuck with me. I can promise you, however, that whoever you serve this to will not mind. 1 1/2 cup plus 2 tablespoons all-purpose flour Ask a question about this ingredient. 3/4 teaspoon kosher salt Ask a question about this ingredient. 3/4 cup plus 1 teaspoon sugar Ask a question about this ingredient. 1/4 cup vegetable or canola oil Ask a question about this ingredient. 1/4 cup mild olive oil Ask a question about this ingredient. 2 tablespoons whole milk Ask a question about this ingredient. 1/2 teaspoon almond extract Ask a question about this ingredient. 2 tablespoons cold, unsalted butter Ask a question about this ingredient. Quick and relatively easy, this recipe is REALLY GOOD! It was as if I went to a French pastry shop. I only made it because someone gave us a lot of peaches and I had to do something with them. MAKE THIS RECIPE. I have made this with many types of fruit and with a simple nut crust, very good. FABULOUS recipe! Whenever I travel, I always cook for folks...I take my knives and spices, but not my pans. I think - the next time I travel - I'll also take this recipe with me! Sometimes the peach skin gets tough, can you score it horizontally before cutting it vertically? Or does the skin peel up and burn then. My skins just cooked into nothing. They weren't tough or noticeable in any way. I made this last night and it was fantastic. I had bought white peaches, but the first one I peeled was mealy. I had nectarines which I used instead (and didn't have to peel them!). This is one of the nicest summer fruit tarts I've ever made and tasted. The tops of the fruit emerged caramelized and there was a beautiful shiny glaze to the surface of the tart. There was crunch from the topping and as well as from the fine pastry. This is lovely recipe and a snap to make. I scoop of vanilla ice cream made my dinner guests very happy. Peach season is almost over. I have to make at least one more of these tarts before fall season sets in. Maria S., again. Made it with peaches for the party. Big hit. Loved the way the peaches and sugar mixture created their own glaze. I maybe left mine in the oven maybe three minutes to long, there wasn't too much crunch left on top. And next time, I would chose a milder olive oil, because I tasted a little too much olive oily taste coming through in the crust, but no one else seemed to mind. I used what I had on hand and loved the ease of the recipe. It also looked incredible and drew the much appreciated "You made that," comment from a fellow guest. I baked it in a rectangular tart pan. Also, I liked making it along with slide show. I found it confidence-inspiring to check my results - at different stages - with the color photos. We had this for dinner tonight. It was very tasty and so easy to make. My 8 & 9 year-old kids made it under my supervision; only thing I did was cut the peaches. Thank you for such a great recipe. That was "real keeper" (dang iPhone keyboard!). At vacation house with best friends for Labor Day weekend-just finished dessert to RAVE reviews. Most said it was the best dessert they had ever had; I said it was the best dessert I'd ever made. Added some raspberries we'd just picked. The crust is sublime. Best summer dessert ever--a deal keeper!! I especially like the idea of not blind baking the crust. Just bought a bunch of peaches today. You had me at not peeling the peaches - love it! Um, I am bringing dessert, not desert! Mmmm. Have to bring desert to a party on Friday. My nine-year-old told me "I'll make my chocolate chip cookies for the kids." For the adults, I think I'm going to try this -- if I can find peaches ripe enough tomorrow. Amanda, have you ever substituted plums for the peaches? Might fall apart too much? I haven't but I would think that the oval Italian plums just coming into season now would work really well because they have a sturdy flesh. Made this last night using the last of the season's sour cherries (with extra flour) instead of peaches and it was a huge hit. I love that all the ingredients and equipment are staples- the ultimate vacation dessert! 11-inch -- see step 1 of the recipe, it's explained there! Guess what's for dessert tonight?!? I can't wait to try it! Made this last night. It was super-easy to put together and looked beaultiful. I wasn't a big fan of the crust though. It is too salty for my taste (and I used the correct amount of kosher salt) and it doesn't didn't hold up the peaches very well. Next time I'll cut back on the salt and will place the tart very close to the bottom of the oven (it's electric) to try to set the bottom crust better. Otherwise this is a great recipe that I plan to make many more times!